THE MADAGASCAR VANILLA BEAN SHORTAGE CONTINUES. 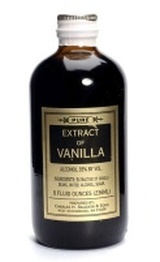 VANILLA EXTRACT MAY NOT SHIP OUT AS QUICKLY AS IN THE PAST. DUE TO THIS SHORTAGE AND HIGH DEMAND, MANUFACTURING , AT TIMES, WILL BE DELAYED. THANK YOU FOR YOUR PATIENCE. Our signature product: Hand crafted from Bourbon Madagascar vanilla beans and aged in oak casks. Ours is a sweet, intense flavor sought after for over 125 years. Grade A prime beans hand selected by us to give you the best value and best beans possible! Vanilla beans ground to a fine powder (not to be confused with vanilla powder, which is a blend of dextrose and extract). Use in addition to vanilla extract for exquisite vanilla flavor! Great for homemade ice cream, whipped cream, crème brulee or any dish where you would like to see and taste the vanilla flecks. One of our best selling extracts, made from the highest quality bitter almond oils. A potent favorite amongst our pastry chef customers for biscotti, pizzelles and holiday cookies. An intense extract made by a similar process as our vanilla from espresso coffee beans. Made from the finest oils to give a true flavor that will not bake out. A favorite of bakers for cakes and icings. An old time favorite for ice cream making, candy and icings, made from the finest oil available. An intense flavor for any recipe requiring a “hint of mint". Add to boost the banana flavor in muffins, breads and bars. Use in cakes, icings, breads, ice cream, coffee syrups. Add to your coconut cream pie, a drop in coffee, add some tropical flair to frostings, pancake batter, syrups, cookies and candy. An excellent choice for any recipe requiring an intense maple flavor. Add to cakes, cookies and muffins – perhaps a drop in a tropical drink is in order! Use in puddings, cupcakes, frosting, ice cream making. Great addition to chocolate: icings, cookies, cakes, puddings, pies, etc. An old time favorite for candies, icings or ice cream with a lingering buttery rum taste. Add to whipping cream (gives a subtle pink color and flavor), icings, etc. Gives an extra strawberry blast to your strawberry shortcake! Brings you back to the soda shop days! Can add to homemade ice cream, make a “Black Cow” cake: Vanilla cake with Root Beer Icing, use with your seltzer/soda maker! One of our oldest recipes, this rich, complex flavor is a result of mixing several of our extracts and flavors together, yielding a wonderful product that’s a favorite for ice cream, icings, pies, pound cakes, whatever your pleasure!